The following makes interesting reading. Thanks to In Daily for their reporting; The question of Councillors being members of the Devlopment Assessment of local development has always been vexed. Should Councillors have a roll to play in development assessmen? Does the balace between elected members and selected experts give the right mix to look after both resident and development interest? Adelaide | Planning Minister John Rau wants elected council members off development assessment panels – and he’s questioning the value and continued existence of the panels altogether. Last week the Minister moved to overrule a DAP ruling on a city development by rezoning the development site – essentially changing the rules under which the DAP had made its decision. Rau told InDaily last week he was leaning toward wholesale planning reform. “As a general proposition, councillors being involved in DAPs at all I think is a very very debatable issue,” he said. “My personal view at the moment is leaning towards saying they shouldn’t be involved at all. Looking more broadly, Rau called into question the continued existence of the DAPs themselves. “I think (the issue) is an example of a broader matter that we have just canvassed a little, which is the question as to whether the whole concept of DAPs as it’s been constructed is the best way to go. Rau’s comments represent a strengthening of his position after he initially called for councils’ roles in planning to be reviewed in August. Development assessment panels are made up of elected councillors and independent planning experts. They assess developments against a council’s development plan. The planning system is currently being reviewed by an expert panel led by Brian Hayes QC, which is due to report in August next year. On the specific DAP decision about the St Andrews development that he chose to overrule, Rau described the DAP’s decision “bizarre”. “It was clear that there had been a decision made by the council DAP which was out of step even with the council’s own mooted changes to its development plan,” he said. “There are some times you can follow proper processes to the nth degree but come to what is manifestly a bizarre outcome. The developer behind the project alleged the assessment process had been marred by conflicts of interest from two of the DAP’s council members, and threatened legal action, the City Messenger has reported. Rau said he had “no information” about any potential conflicts of interest or failures of the system. THE nearly 100-year-old Millswood Underpass would go from eyesore to art space under a plan by a local MP. Ashford state Labor MP Steph Key is leading the charge to brighten the dull concrete Goodwood Rd passage under the Belair rail line. “Goodwood Rd really is the gateway to the city,” Ms Key said. Installations by school groups, SA Living Artist Festival artists and designs promoting the Royal Adelaide Show could adorn the concrete walls. Last week, Ms Key met with members of a committee charged with exploring possible options for the site. The committee includes representatives from Community Arts Network SA and Unley Council. “We would just like it to look better,” Ms Key said. She said, given the underpass opened in March 1915, now was the perfect time for the project. “It would be nice if we could have a new and improved, beautiful underpass by the centenary,” she said. A facelift of the area would also tie in with a renewed push to reopen the Millswood Railway Station, which has been closed for the past 18 years. “I’ve been campaigning on (reopening the station) for 10 years and I think the minister is warming to it,” Ms Key said. 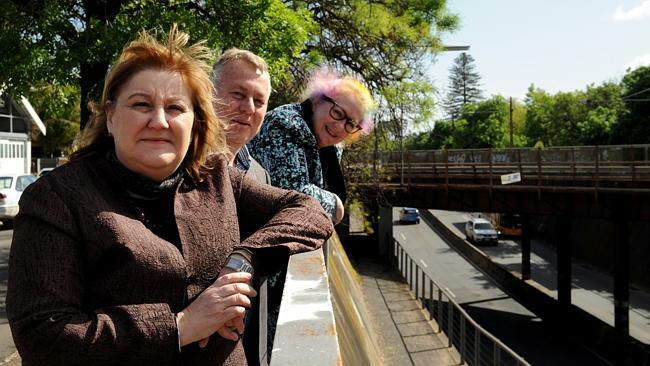 Unley Mayor Lachlan Clyne said the underpass was “well overdue for a major overhaul”. “It’s a great opportunity to improve the amenity of that area,” Mr Clyne said. The committee hopes to have the art space plan ready for public consultation ready in November. Just to add my bit, I have seen this news many times before, I hope this time the committee (whoever they may be) will get the work designed and approved and maybe even completed before the state election in March. Seems like a good time to ask politicians to get things done especially when you hold a marginal seat. Thinking about just this last week, Monday was Full Council, Tuesday the Clarence Park AGM, Wednesday the CAG and Thursday the Citizenship ceremony. 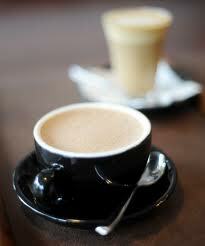 Friday I had time for a coffee with an old friend from Council that you will remember, Les Birch. He loves to catch up and hear the latest news, when we finished he was off for a ride on the new bike path to check it out. When one of the significant blue gum trees was recently removed from Forestville Reserve the wood was offered to local artists for possible art use. One artist has used this wood to create work currently on display at the Ex Aqua exhibition in Light Square Gallery. The photograph is of one of his exhibits. 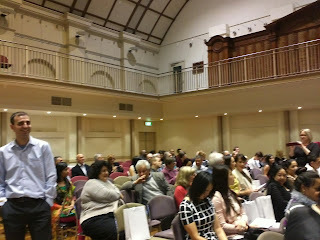 The citizenship ceremonies are one of the more enjoyable events. It is a always a pleasure to welcome new citizens and I am always amazed at the number of different countries that they have come from and learning of their journey to get here and their aspirations for the future. Last night saw 60 residents become citizens from 23 different countries. The Town Hall makes a great venue. Additional sound proofing will be installed at the Fairfax Ave crossing to protect Chromer Pde residents from additional noise from the warning bells. Richards Tce fencing will be replaced at least 300mm higher than the existing and up to 600mm. There will be some modification of traffic flow in Lyons Pde. The graffiti removal programme will be in place as soon as the project is completed, this may be done by City of Unley volunteers. The fences along the Greenways project are too short to retain the privacy they offered before the rail line was raised. All fencing needs to be assessed, replaced or repaired and attain a height of at least 1800 mm and preferably 2100mm. Tree Damage to Tennis Courts Unley Oval (Cr. Hudson); this seeks to have a root barrier installed a Unley Oval to allow for two large trees to remain near the tennis courts.LOST; Staff are working with Sturt Tennis to replace the affected lawn with a different species. DPTI tree removals; Cr Saies asked staff to investigate legal action regarding the removal of regulated and significant trees during the rail projects that were to have been preserved. Many of these trees allegedly had their roots severed by careless contractors and were removed. This motion would include the tree in Arundel Ave and the two gums recently removed in Canterbury Tce. The replacement of signals on the Belair line in Mitcham has caused some consternation from nearby residents. The new signals are legislation compliant but, according to residents, even with sound proofing in their windows the noise is still disturbing their sleep. Many residents do not have sound proofing and are requesting this and/or for the signals themselves to be quieter. What does this herald for the Victoria St, Leader St and East Ave crossing? What does this herald for the Fairfax Ave crossing? At every briefing or meeting I have attended residents have been told that the signals will be loud enough to be audible and safe and yet still allow for peaceful living for residents. After 8 months of concerns fronm residents no examples have been given or suggestions made;only that DPTI would do it's best to keep the residents happy. Either Millswood/Goodwood is getting something different or we may not have been told the truth! This meeting will be held on the 24th September at 5pm at the Community Centre (Clarence Room). This is an opportunity to get a report on the great things the centre has achieved in the last 12 months. The Board has a number of Community Representative positions that you might give consideration to nominating for. The final meeting of this group will be Wednesday 25th September at Millswood Lawns Bowling Club at 6pm. This is to be a celebration of sorts and we will discuss some of the remaining issues. Those issues not resolved will have to be sorted out in other ways. This meeting was always more about giving information than solving problems ( although many were solved or negotiated to a point of agreement and we are grateful for that). Hopefully almost all the outstanding issues will at least have a proposed solution on the night. The Unley Museum’s newest exhibition has something for everyone. From the young in age to young at heart there are toys, toys and more toys. Over one hundred games, toys, animals, dolls and miniature items are on display. Toys can evoke imagination or imitation while drawing on the real world. Many teach physical coordination or important life skills like counting or rhythm. Some toys reflect the social and economic influences of the child’s contemporary world. Toys with all of these themes will be on display until Wednesday 18 December 2013. There is a visual display of the top Christmas gifts for the last hundred years as well as an original 1930s Monopoly game. Come and find out what decade was dominated by the Etch-a-Sketch, the origins of dolls and when balls first appeared as a child’s toy. Why not try out some of the toys yourself? Indulge your inner child by pulling along a wooden replica that ‘bobbles’, or build a towering structure with our blocks and dominoes. Challenge your friends to a quick game of quoits. You also can fold a paper airplane that will soar in the sky or strike a beat with the maracas and tambourine. Dilapidation Millswood/ Goodwood/Black Forest/Clarence Park. The topic of dilapidation during the current works has been an issue for many residents right from the start. What would happen after DPTI left to the broken kerbs, damaged trees, damaged footpaths and roads when DPTI was finished. We have been reassure continually that a record was made before the works began and that all damage would be repaired by DPTI. Somehow I have never thought we would see this happen. 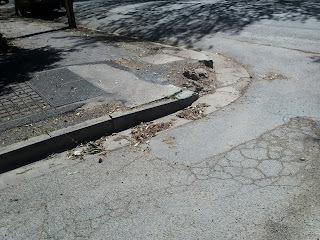 I am quite sure that the visible broken kerbs and potholes will be mended and filled as they are easily identified. My concern is about the long term damage that has reduced to life of the roads that have seen huge trucks traverse the streets for over 8 months. 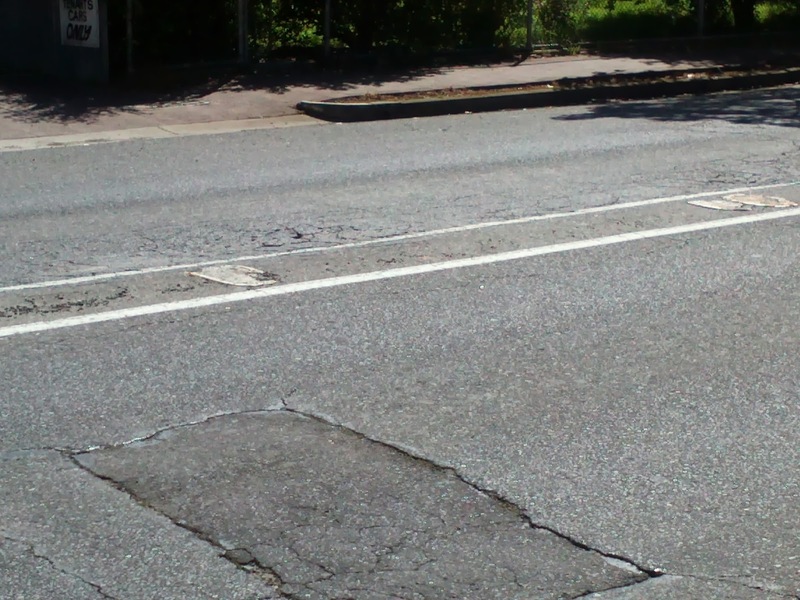 These roads are still in acceptable repair but the life of the roads may have been reduced by 50% or more. Who will pay when Cranbrook Ave fails in 2020 instead of 2040? Who will repair the potholes in East Ave after DPTI have moved on ? The answer is that residents will expect Council to do this and it may well be the residents that pay. My motion, with the support of Don, that goes to Council on the 23rd Sept seeks answers to these questions and commitment from DPTI to pay for the ongoing maintenance of the infrastructure they have used. may not need immediate replacing. signing off on the agreement with DPTI. The Swimming Centre opened on Saturday 14th September, for the 2013/14 swimming season. We have experienced a successful first week of operation, despite mild weather and competition from The Royal Adelaide Show and City to Bay Fun Run. 237 people have purchased memberships, including 96 committing to the season pass option. $61,317 in income has been received over the first six days compared to $50,235 during the same period last season. During the winter a number of capital works projects have been completed at the centre. These have included installation of new high efficiency water heaters, resurfacing of the 50m main pool surrounds and replacement of several shade structures, under the Asset Management Schedule. Swimming Centre staff undertook a successful training week and induction. The training focussed on centre operational efficiency, customer service and promoted the principles of the organisations preferred culture and values. Staff updated essential qualifications such as first aid, water safety and resuscitation techniques. The centre received some positive media coverage during the past week in the form of a season open and water safety article. This was placed on news.com and also in the current Eastern Courier. This evening, Friday 20th September, a live weather cross is scheduled to occur from the centre with Kate Freebairn during the Channel 10 evening news. Events intended this season at the centre will be the annual MS Mighty Swim in February, 2014 and with council endorsement, a second family twilight movie screening is intended for March. I hope the weather is favourable for the season’s operations with a long summer predicted and look forward to a safe and successful 2013/14 swimming season. The good news this week is that one more fence will be replaced by DPTI along the Greenways project. These fences that used to back onto the railway line are generally in very poor repair as DPTI would not maintain them and residents could not either as they were not allowed to work in the rail corridor. However, these fences are now along the edge of the Bikeway/walkway and are often unsafe, this has been compounded by the loam placed against the fences (ready for planting) to a depth greater than 200 ml which then would require a development application. As well the train line is higher and the fences are now plainly too low to provide privacy for the residents. This now makes 4 fences that have already been or will be replaced. What about the others? The fences on the other side along Chromer Pde and in this location are also in very poor repair. We're still waiting to see which will be replaced and just how much longer residents need to wait to see the one colour paint job (slate grey)that will remove the graffiti and enhance the entire appearance of the area. Each year the Panel is required to present a report to Council on their activities. It is interesting to note that earlier this year they suggested a change in delegations (that was approved by Council) to give the staff more discretion in the decision making process. This has reduced the number of items coming to the DAP for a decision. Hopefully, this will have allowed for more time and consideration being given to the items that needed a decision. The number being dealt with have dropped from a maximum of 16 to as few as 2 at a sitting. Good, healthy debate has led to many decisions that did not concur with the staff recommendation (up to 2 per meeting). The report does not tell me if the recommendation was for approval and the application was refused or vice versa. However, if this was the case these are the decisions that would often lead to appeals to the Environment, Resources and Development Court. There were only 6 appeals lodged in 2012/13 and of these 1 was dismissed, 1 withdrawn, 2 compromised and the others must still be before the court awaiting an outcome. Interestingly, more than half the meetings did not have all members attending, this potentially gives the chairperson both an ordinary and a deliberative vote. The final feedback has now been provided to those that participated. Overall 71% of participants said they would continue with the service if it was to be made available. The greatest problem was that the street sweeper only came as planned 33% of the time, however, despite this most people moved their cars from the street if they could before it was swept and almost 60% of respondents also always or usually swept their footpath as well. Placement of no-parking signs on the street the evening before it is swept. Hopefully, the results of this are encouraging enough for this service to be available to all residents on request. It is in this case not the residents blaming Council but DPTI once again. How is it possible for Council to be responsible for fencing along the Greenways project when it does not own the property? Council is responsible for the landscaping and has commenced adding loam between the fences and the pathway. Residents who were offered a new fence on completion of the project are now being told that this is no longer the case, only because they asked when theirs would be done and not because DPTI actually sent a letter to the persons concerned and officially reneged on their offer. This is difficult and unnecessary for all parties. Fences that are in poor repair need to be replaced to enable pedestrians and cyclists to move safely along the new pathway and to provide the affected residents with the privacy and amenity that existed before the work started. I for one am sick of broken promises and different stories from different people in this regard. Remember Don and I will be at Carnevale (East Ave) tomorrow (Sun 15th Sep)between 2pm and 4pm to discuss with you your ideas and complaints. This offer has only been made on line, next time we will probably letterbox an area. The first 5 coffees are on us. It is always a pleasure to chat with residents and I reckon a coffee might be more productive than the supermarket aisle. Presented by David Corkill and Steven Hoepfner. Improve the amenity of hospitality venues and precincts. Do you have a mail box that constantly seems full of junk mail? Pop in to the Civic Centre at the City of Unley and grab yourself a free "No Junk Mail" sticker for your mailbox, available at the front desk now. Under the new Independent Commission Against Corruption laws Councilors must declare the value of any gifts over the value of $100. A register will be kept of all the gifts that each individual Councillor receives, as a Councillor we must enter these on the register. The reality is that from my own point of view these gifts are few and far between. However, we do all get two Honorary membership passes to the Show and we all get tickets to all Sturt Home games. But what is the value of the tickets? According to the Show website I could have purchased these tickets for $145, however, if I were to use them every day the value could be as high as $400. So what is the value to be included on the register? I rarely attend the Show but my family has enjoyed using them. The same will be true for the Sturt tickets but I won't have a dilemma with these, I will give them back as I never go to football games. This group met for the first time since last November last night. The delay has been caused by Council's reorganization of committees, a call for new community representatives and legal advice that recommended the advisory groups would better serve the needs of Council and residents than the more formal structure that existed in the past. Unfortunately, this also means that agendas and minutes will no longer be available on the Council website. The group discussed ways that they could keep the community informed on the business discussed. It was decided to activate a blog site in the name of the committee, to use the available notice boards and to also use this blog and that of my colleague, Don Palmer, to let people know what was being discussed and to feed ideas for discussion into the group. When the bog is up and running I will let you know and direct you to the site. At the most recent call for nominations there were insufficient nominations from the community (the area bounded by east Ave, Victoria St and the Seaford train line) from residents. The group still requires 3 more members. If you are interested please let me know and I will send you email onto the relevant person to give you the detail that you will need to nominate. Discussion revolved around meeting procedure and recording of notes, the upcoming Goodwood Oval-Millswood Lawns Masterplan and the shade-cloth on the tennis courts. It appears that hockey has had a good season, the Goodwood Saints have several teams in the finals and the tennis is booming!Cricket is looking forward to the new season on what they describe as the best facility in Adelaide. Greg Wilson was elected as chairperson. It would be much appreciated if you can take 5 minutes to submit a vote for your favourite Mainstreet in our great region. The People's Choice Award asks the communities around South Australia about their mainstreet and highlights incredible loyalty and support for the heart of the community. Please send to family and friends to show Unley’s Precincts are the best in SA! I encourage you to forward this email to your family, friends, constituents and networks to vote before this Friday so the City of Unley is in the running for this prestigious award! You will all have, by now, received your Spring Unley Life magazine. It makes an interesting read over a cup of coffee for most people. However, if you read the Mayor's report you could well be thinking that the bulldozers and builders were just about to start on the work. This is not the case. Council have had Masterplan presented to it and Council has asked for further detail, no decision has been made to proceed with any work at this time. Council still need to determine the needs of the Sturt Cricket Club and ascertain if the Sturt Tennis Club and the Sturt Bowling Club are happy with what they already have (it is my understanding that they are). At this time the project is completed unfunded and is likely to remain that way until Council manages to get a grant to complete some or all of the work that could be done! Members of the G-RAG committee met last week to discuss with Rod Hook their concerns about he 'Death Threat' article in the Sunday Mail. The meeting was quite amicable with the CEO recognizing the good work that this group has been doing during a very trying and tiring development by DPTI. This has resulted in a letter being sent to the Eastern Courier, that hopefully they will publish, that is a a clearer explanation of events and recognizing the efforts of G-RAG in a very positive manner. The 'Find Your Everything - Unley Precincts' program is proud to partner with an iconic Unley Road business, Rawson’s Elite Appliances, to offer a fantastic $6 000 kitchen appliance pack to encourage customers to shop, dine out and experience the best of Unley Precincts. Look out for us at the Royal Show in the technology hub (Duncan gallery Goyder Pavillion - north end adjacent SAFM) where show goers can check out the prize pack whilst we will promote the website, our region and encourage them to register for the competition (3 x iPads to browse and enter competition are provided on site). Myself, Laura (councils part time Mainstreet administration coordinator) and few dedicated Rawson's staff will staff the booth on a rotating roster for the duration of the Show. Following the Royal Show, the prize pack display will move to spend time at the Unley and Goodwood libraries to promote the upcoming libraries festival in the 1st weekend of November. Rawsons are providing the kitchen facilities for the cooking display as part of the festival. The primary objective of this promotion is to collect contacts (members) and Facebook 'likes' for future communication. This will increase the exposure of Unley businesses featured on the site to a predominately new audience. Please share this with your friends, family and networks so they can enter the competition at www.findyoureverything.com.au. Don't forget to subscribe to the regular e newsletters showcasing 'featured finds' from the Unley Precients and like us on Facebook for regular updates. The words of Matt grant, thankyou. Last night was the penultimate meeting of the CAG. It has been a long haul for this meeting and difficult for both the staff of DPTI, Theiss York and residents. This meeting was better than most although there are still some outstanding issues, ones I thought had been resolved. 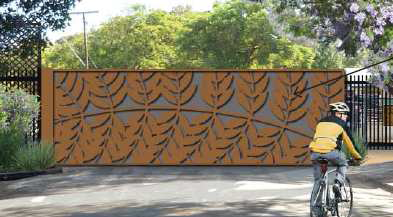 It was good to hear of positive consultation with 3 residents in Cranbrook Ave and that at last they had had an opportunity to discuss the gate design with the architect and that a reasonable solution has been reached. The final 2 designs are now open for public consultation. We were also told, in complete contradiction to what Rod Hook told both Don and I at the meeting we had with him, that the fences facing the rail line would not be painted. This matter was agreed with Rod and we also agreed that they would be slate grey/charcoal. Other outstanding issues remain a small portion of missing fence at the end of Cowper Rd, a sound proofing gap in Lyons Pde and the effect on residents in Arundel Ave from the change in location of the passing loop. While residents were told DPTI were considering extending the lattice fence no reassurances were given. DPTI continues to hide behind what their legal obligation is to the letter instead of doing the right thing. The final outstanding matter is dilapidation and how this will be managed. I intend to take some photos for a separate blog and put a Motion on Notice ( with Don) to ensure Council is fully informed of the extend, the issues and the compensation that will adequately cover the long term damage to Council infrastructure. The final meeting on the 18th September will be a celebration of sorts. The venue is yet to be decided. 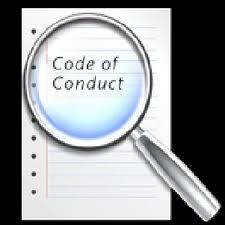 The state government recently enacted legislation to bring in uniform Code of Conduct across all Councils. While much of it remains similar to what Unley had developed there have been some changes. This legislation has the support of the Local Government Association and it's intent is to support the work of Councillors. Who wouldn't want open, responsive and accountable governance? Who wouldn't want Councillors to be have with honesty, integrity, accountability and transparency? These statements show the principles by which we must abide but are essentially what is often described as motherhood statements. The Behaviour Code is similar and includes statements about community expectations (not sure how that works if you think we're all crooks? ),commitment and conscientiousness, trust and confidence. It states that Councillors must comply with all policies, be respectful, express their views and observe meeting procedures. r will be investigated at the Council level wherever possible. If found guilty of an offence the censure possibilities have a little more teeth than before. Councillors can also be guilty of misconduct; this might include failing to declare an interest in an item being debated or higher level misconduct such as accepting bribes. Councillors must now declare all gifts with a monetary value above $100. So someone paying for the odd cup of coffee is still OK and if you are really a crock you will be dealt with under the Criminal Code. The dead, or near dead, Ash trees in both Canterbury Tce and Parker Tce will be removed from the 2nd September. There may be some disruption for traffic during this time. Residents have given approval for this. Replacement trees will be planted in Parker Tce after a review of the parking to see if additional spaces can be found. Trees in Canterbury Tce may not be replaced depending on the outcome of the further consultation regarding the alternatives in retaining two way traffic. Goodwood Primary School is to have a safety camera installed on Goodwood Rd to monitor (read fine) cars choosing to ignore the signal to stop. Council is still negotiating with DPTI regarding the purchase of some of the properties in Devon St that DPTI acquired to build the culvert. Several trees in Aroha Tce have removed after extensive consultation and DAP approval. These trees were considered to be structurally unsound. The Farmers Market is celebrating it's 7th birthday on the 6th October- there should be lots to see and do that day as well as your usual purchases. The Black Forest Local Area Traffic Management Plan comments have been given to the consultants to make their final recommendations and prioritization of works. Council is now in a position to recommend a 25km speed limit in Leah St for the duration of the works. Remember originally we anticipated that the work would be finished before the report was available. Well it is not quite finished but the report still needs to go to the Minister. seems like it has taken just long enough for nothing to change. The new Goodwood Oval Reference Group will meet on the 11th September for the first time. This group meets to share information between residents, the Hockey and Football Club as well as Tennis SA. The property on Railway Tce that has caused so much difficulty for many is now been referred to the Court system. An outcome will eventually be delivered.